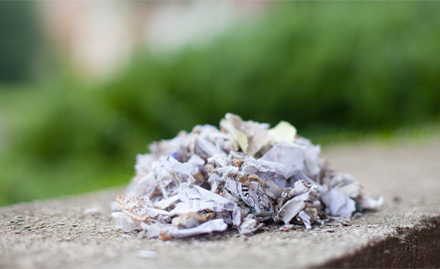 At A Plus, we not only come to you and shred your documents onsite, we PULVERIZE your documents. That means total document destruction. You are assured that there is no way anyone could put together or reconstruct your important documents or information when A Plus is your shredding company. Just take a look at the document to your left. 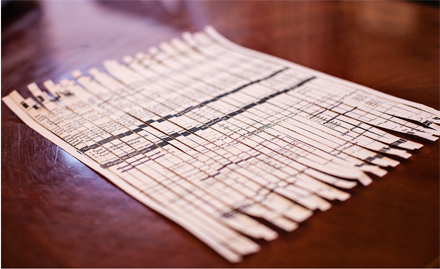 What you see is a shredded document using an old or standard method of shredding. You can also see that if your documents were shredded using this process your documents, and all of the information in those documents can be reconstructed. That’s right! You credit card information, social security, and your address; in fact anything that was in that document can be captured and used when using this type of process. The fact is, just because the shredding company says it shreds and comes to shred or pick up your documents doesn’t mean that others won’t be able to gain access to these types of shredded documents and, with time, put them back together. Do you want to work with an out of town, not sure where it goes or how it is shred company that your documents can be reconstructed, or do you want a locally owned and operated document shredding company that will not only shred your documents but PULVERIZE them beyond recognition? Pick-up or On-site Document Shredding! If you are using a document shredding company that just picks up your documents, places them in a bag and throws them on a truck you need to review your agreement and their shredding process. These types of shredding companies are known to take the bags to a shredder location where they could sit, available to anyone that takes the time, to access your information. These bags, according to some agreements, are allowed to sit for as much as three or more days before going into the shredder. Your team did a great job. Extremely professional and efficient. Thanks for accommodating my shifting schedule. Best, G.D.McC.